Why German Is Easy is a language hacking eBook written by the most famous language guru in the world, Brendan “Benny” Lewis. He tells that he had studied German for 5 years at school, but when Benny visited Germany, he wasn’t even able to buy a train ticket using German. 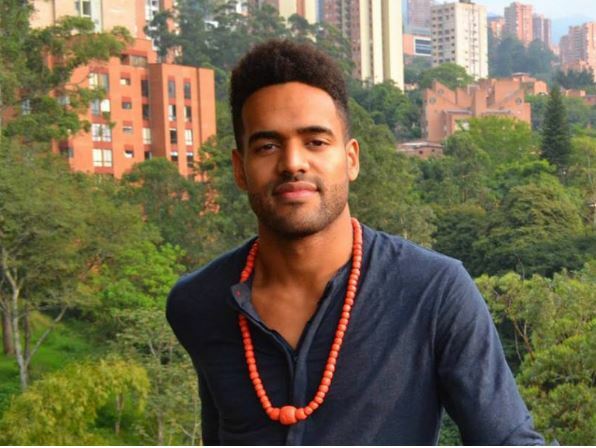 After many years, when he had learned better techniques to master new languages, he took a challenge to become a fluent speaker in German. He set the goal to reach C2 (=the highest) -level in three short months. He started an intensive studying and went to a language test. He passed 4 out of 5 parts in the C2-language test. He had become, not only a fluent speaker but almost like a native speaker. In this course, Benny shares his language hacks for learning German. What Is the Content of “Why German Is Easy”? Why German is Easy -eBook consists of 3 parts. In the first part, Benny gives an introduction to the book and his language principles in general. In my opinion, language learning is 80% psychology and only 20% of right techniques. When you have a right mindset, you will learn a language much faster. That’s why the first part of the book is highly important. For example, instead of being afraid of making mistakes you can start embracing them. It doesn’t mean that you would make mistakes on purpose but use mistakes as proof that you are trying. As John Maxwell says, “Sometimes you win, sometimes you learn.” Making mistakes are an inevitable part of mastering a foreign language. The second part concentrates on German grammar. First, I was surprised, “How Benny Lewis is concentrating on grammar?” :O But then I realized that this grammar part is much different than typical grammar lessons. It doesn’t try to force you different nuances of German grammar like they do in most of the German textbooks. Instead, it teaches great German language hacks that will help you to learn grammar much faster. For example, some English speakers ask, “Why can’t German just add a ‘s’ for plurals like in English?” Actually, in English, they don’t always add ‘s’ for plurals. Think, for example, “child -> children”, “man -> men”, “mouse -> mice”. The third part gives you “hacks” how to master German vocabulary faster. As an English speaker, you have a huge advantage when studying German. They both come from the same language root and they are pretty similar in many ways. Many times you just need to know an English word and then say it, and even a German person who doesn’t understand a word of English will fully understand you. German also has many loan words from other languages like Latin and French. If you already know some French, it will give you an additional advantage when studying German. “Why German is Easy” -eBook is the primary product in this course, but there will also be a few bonuses. I will explain them one by one. In this bonus, Benny will go through step-by-step how you can set German as the main language in your digital devices and Facebook, for example. Setting up German as the primary language can quickly boost your German skills without putting almost any effort. This gift helps you to plan how to study German in your daily life. Benny also shares many useful links and resources that can be helpful and creative ways to learn German. Anki is a free language learning software that helps you to learn words with flashcards. Typically you need to set up your words yourself, but in this bonus, Benny gives you his flashcards so you can use them. There is a vocabulary for beginners and advanced German learners. Who Is “Why German Is Easy” for? This course is targeted mainly for German beginners and intermediate speakers. The tricks and principles that you learn in this book will help you to master the German language. But remember, none of those tips in this book will work until you put them into action in your life. I think that also advanced German speakers can learn something from this course, but this will probably be more profitable for those who are just starting or have an intermediate level with German. In my opinion, this book is especially those who think that German would be hard. After reading this book, you’ll not feel like that anymore ;). 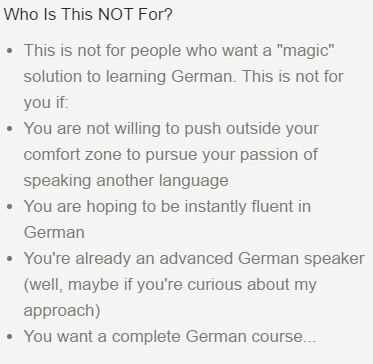 Here are only 4 reasons why German is easy but in his eBook shares, even more, reasons. I think that nobody who has read this book will say anymore that German would be difficult. This course costs $37 which equals to a price of a shirt or a dinner in a restaurant. In my opinion, it is a reasonable price of this course because a benefit can be much greater for your life. Imagine that you learn to speak a German fluently and it will have a great impact on your job career. Then this course will potentially give you the value of thousands of euros. Yesterday I went to buy food from the cheapest grocery store in the country and a total price was around 46€ ($50). And I am just a single, so I am buying food for myself. If I compare how much money I use on buying food, I think that this course is quite cheap. Of course, one can try to find these tips for free on the Internet which is entirely fine. But it also takes time. In this book, the most famous language guru has collected his tips to one book. You may also want to consider getting Benny’s Fluent in Three Months where you will get material for more than 10 languages by buying a single product. 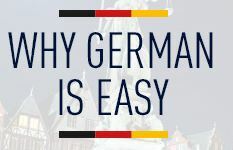 This short course “Why German Is Easy” is a useful tool when mastering German. I think that this course would be beneficial for everyone who wants to learn German. Especially I like the mindset of Benny Lewis. He knows from own experience that languages are not hard if you are learning with correct methods. If you are using “language hacks,” your language learning process is much easier. But if you concentrate on learning with slow and difficult methods, it may take 10 years to master German. But when Benny started to learn with right methods, he mastered German in three short months. => Get “Why German Is Easy” Today! 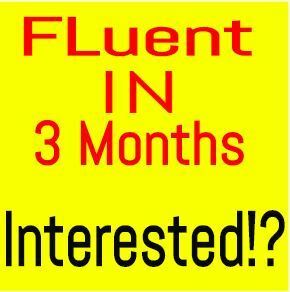 PS.If you are interested in learning more languages, then I would recommend getting the whole Fluent in Three Months course because there are tools for more than 10 different languages. If you have any further questions about this course, don’t hesitate to ask and I will be more than happy to answer personally. Have you used Benny’s products? Did you find them useful? I have a friend who is German. She told me that Germany has much better living standards compared to living in America. I have another friend who heard of that too and is willing to live in Germany for the rest of his life. The only problem is that he doesn’t speak German. I’ve looked into the German language. It is pretty complicated. Your German hack seems to be something that anybody can pick up easily and be fluent in a short period of time. I will definitely let my friend know about it, because he is planning this out for his future after all. Thank you. It’s interesting to hear that in Germany would be a higher standard of living than in America :O. I have always thought that it’s the opposite. But I have never lived in neither of those countries so I don’t know how is it. Wow, he really does make it sound so easy. I’m already bilingual so I’m no stranger to having a second language but both I spent years in school trying to understand. I still find english to be the more complicated of the two even though it’s the one I use 80% of the time. Would the same kind of hacks apply to similar languages like Dutch and Afrikaans? I am sure that there are some language hacks for Dutch and Afrikaans too. Probably not all are similar like in German but some principles apply to any language. I don’t have almost any experience of Dutch or Afrikaans because I have never really studied those languages. But I will take a look and probably add some resources to my website later on. Will you suggest I learn German (or any other language with alphabets) or a language with characters similar to Chinese (Korean, Japanese etc)? I recommend to study the language that you are more passionate about. Or think, which one will be more useful for you in the future and go for it. I wouldn’t worry too much about mixing with another languages or if a language is hard or not because I am 100% sure that you will learn a new language if you practice enough. German language is really hard to learn. Even pronouncing German words is hard to begin with. This book can really help in learning to speak, and more importantly understanding the German language. And reading your article makes it sound very easy, but then it’s just the tip of the iceberg, a lot will be discussed in the book itself. And the fact that it’s available online (since it’s an e-book) makes it very accessible to people who want to learn the language in a short period of time. I need to completely disagree with you. There are tons of aspects that make German one of the easiest language on Earth. I recommend that you concentrate on those things rather than little grammatical nuances that make may make it feel challenging. German pronunciation isn’t hard because it’s spelled more or less as it’s written. In the city I live, there is a Gothe Institute, where we can learn the German language. The institute provides a short term German course as well as long term German language course. The short term course is aimed at people who want to learn communicative language, and the long term course is for people who are interested in learning German language and literature. When you attend the long term course, you can speak as well as write in German. Until now, I have never taken any interest in learning. Based on what I have read here, this eBook can be very beneficial for the people who are interested in learning German. However, my question is can be actually self learn learn German by using this book? this Benny’s eBook is not a step-by-step guide which will teach you everything about German. There are already so many German textbooks in the world so Lewis wanted to create something different. His eBook will open new perspectives of learning German and it also opens your eyes to see new ideas about language learning. Then it points out various reasons and aspects why German is easy. It will also give several tips that can help you to learn the language faster. So yes, you can use it yourself to learn German. However, it’s an additional resource and itself won’t take you to fluency but it can dramatically speed up your process of reaching fluency. Even though there is a book published about German language i will still get difficulty learning on it and it will take a long time to learn though some basic terms. I never heard nor read a German language before and as a beginner i am curios. Even short term only, i cannot survive from that if i will learn alone. I will need a personal tutor for that. German is not easy as English language. This eBook will put away all your fears and excuses. When you have read Benny’s book I’m sure you’ll say, “Wow! German is very easy!” You just need to get that knowledge. Nothing is hard if you know the right techniques to do it. I’m already a fluent English and Spanish speaker, now I’m deciding to learn a third one, so I started Brazilian Portuguese. I thought that could be easy because of my Spanish base, but actually is harder than any other language, they have 4 different accents, extra letters on the alphabet, and thousands of ways to verbalize words. So, a friend of mine told me to consider German, so this book looks like a very good tool to start. Do you consider this a first book for beginners? Yes, this will be a great start for your German journey. It will give you a great mindset for learning German. In my own experience Portuguese seems pretty easy even though I haven’t studied it. 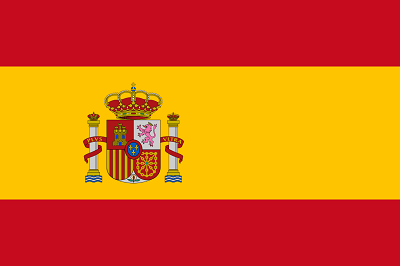 I understand something because it’s so similar to Spanish like you said. I bet that you would learn it fast if you start practicing. Forget the hard things and just focus on your goals. Take one task => practice, take the second task => practice. Soon it will feel easy when you just practice it. I asked from some German people about similar long words and they said nobody ever even uses the examples that I showed. Everyday language is much easier. Of course, becoming a book writer in German would require more skills but you can manage in Germany much more easily. I am always told that German is the closest language to English so the transition from English to German is easy. I know German is not spoken in that many countries but you can still real to more people you haven’t before. Also, I believe German students are taught English. Yeah, German is very close to English. Being able to speak German would open you lots of doors in Europe. It’s the most spoken native language in Europe. If you speak German, it opens you the possibility to work in Switzerland where are the highest salaries in the world. I always wanted to learn German language because I wanted to go there and work there. Germany is a great country. However, I was told that German language is hard to learn. 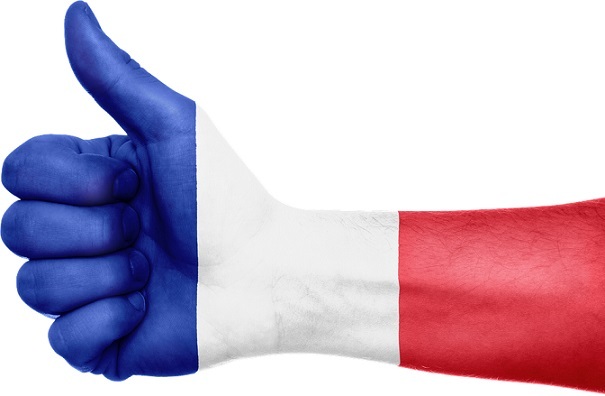 Harder than French according to most. Did someone tried this book already? I am really interested in purchasing this. I have this and other “Why X is easy” books from Benny Lewis. You are able to buy all of them in a bundle here. I have not seen a schooling system that teaches a language in a better way than learning from an expert. Schools will just give a tip of the whole thing to you and expect you to speak the language. Yeah, there are many reasons why the classical classroom teaching isn’t effective for learning languages. It’s a bit unnatural and they also use “one-size-fits-all” systems that don’t usually work very well.